I hope everyone has a wonderful holiday. Be merry, be safe, and have fun! I am grateful for each of you. And may Druids innum’rable bless thee, as they dance on the moor’s fairy-rings! And may all future ages be brilliant with the light of thine intellect’s rays! PS. To all of you who have sent such lovely holiday wishes and goodies by mail and email, as well as everyone who has posted holiday greetings, thank you for your thoughtfulness! Oh no! Don't cry! Yes, Virginia, there is a Santa Claus. Love the poem! Nadolig Llawen and a happy new year! You and Virginia have a wonderful Christmas! Thank you, my friend! And the same to you, too! I hope you and the beauteous Virginia have a wonderful holiday! Thank you so much, my friend! You, too! Happy Holidays to you and yours, and many scritches to the adorable Virginia! Thank you so much! You, too! Here's a Poe-cast for the long evenings, the Tell-Tale Heart and the Cask of Amontillado. And happy Newtonmass to you, too! And a very Merry Christmas to you three! Thank you so much! And to you, too! And I wish the same to you and yours. Happy, happy to you too! Thank you! And to you, too! 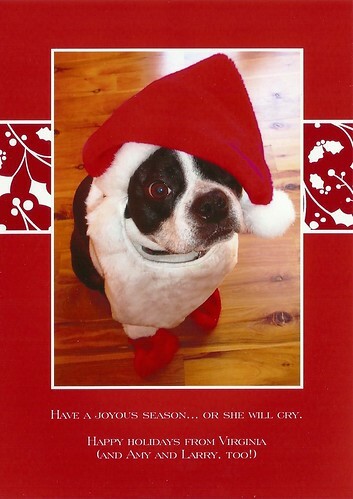 Virginia remains one of the Most Adorable Puppy-faces we have ever known - Merry Christmas! Aw, thank you! *hugs* I hope your new year is off to a terrific start! Loved this year's card. My, what a photogenic model you have there. Hsppy holidays and much good cheer!